Enter figures for Benefits in Kind. We provide a central data entry screen for important employee data. You can quickly set the Join Date, Tax Code, Pay Rate, Department, Leave Date and other key payroll fields. Note the green blob in the header alerting you to special events, such as sickness or anniversaries, which will help you to process the payroll correctly. Sort and filter records to find employees easily. For example, flick through employees by their Start Date or display just employees with a missing Tax Code. Display Guernsey, Jersey and Isle of Man employees on the same simple screen as some fields cleverly change to meet jurisdictional requirements. See equivalent Pay Rates that will be used when entering payroll data later. The main payroll entry screen is powerful and flexible enough to handle anything thrown at it – with over 3 million payslips generated we know we have most payroll options covered. All lines are entered in the same way, so you have a simple and consistent approach to data entry. Enter items in advance, such as a new Salary or end of season Bonus. 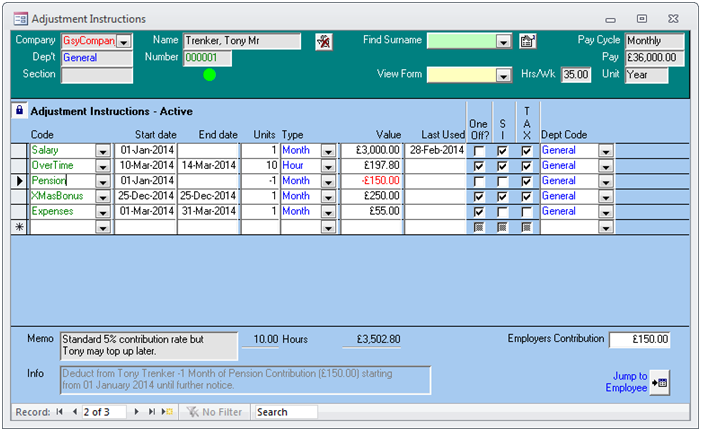 Create new codes with settings for Tax, SI, Pensions, default values, payslip format and more. Change the Department Code to split costs across different codes and departments. Add comments to each line for clarity and accountability. Allocate an Employers Cost or Contribution for accurate cost reporting. Input Rolled-Up Holiday Pay to confirm to Jersey rules. 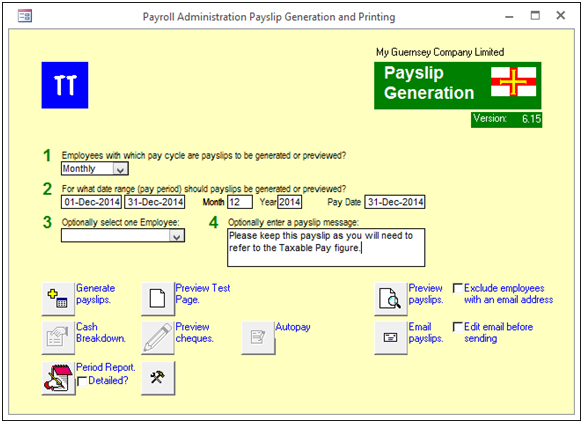 Creating, printing and emailing payslips is quick and easy. This screen, like many others, leads you through the process one step at a time, to guide and help avoid errors. All the essential reports and export files are conveniently available on this screen. Generate payslips in advance conforming to jurisdictional Holiday Pay rules. 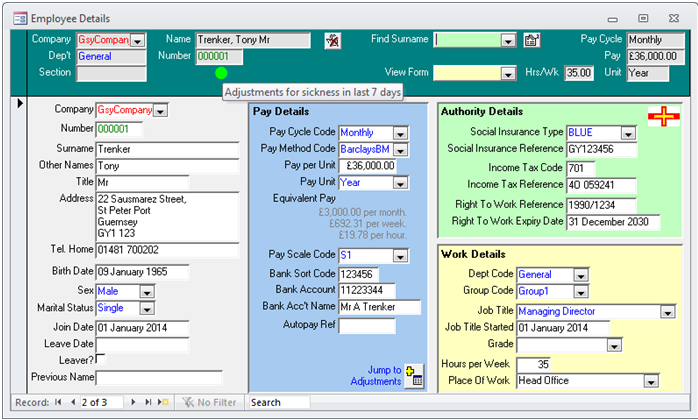 Generate Week 53 payslips automatically using special Tax and SI calculations. 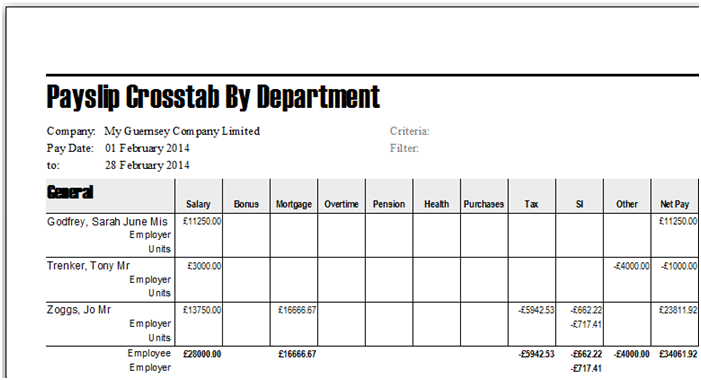 Select from over 20 different payslip layout and formats. Produce a Cash or BACS reconciliation report. Amend any final figures to correct mistakes quickly. Generate invoices from payroll timesheets with mark ups and GST.